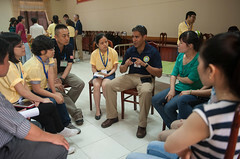 Topics discussed during the training June 9 at Da Nang Military Hospital included trauma management, wound care, triage, and toxicology. 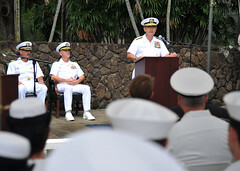 Members of U.S. Pacific Fleet (PACFLT) staff and military commands throughout Hawaii gathered to commemorate the 72nd anniversary of the Battle of Midway during a ceremony at PACFLT headquarters, June 6. 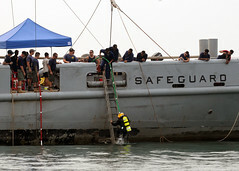 In a training evolution to be conducted as part of the Cooperation Afloat Readiness and Training exercise series, U.S. Navy divers, assisted by personnel from the Indonesian navy, will survey the World War II wreck of the cruiser USS Houston (CA 30) in June. 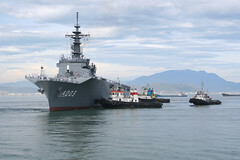 The Japan Maritime Self-Defense Force ship JS Kunisaki, carrying a multinational crew of U.S., Australian and Japanese personnel, arrived in Da Nang June 6 for Pacific Partnership 2014, beginning nine days of collaborative medical and engineering activities with the people of Vietnam. 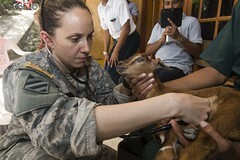 Veterinarians from the U.S. Army Reserve shared expertise with Indonesian animal doctors and veterinarian medics during a veterinarian subject matter expert exchange in Ba'a, Indonesia, June 2-5 as part of Pacific Partnersip. 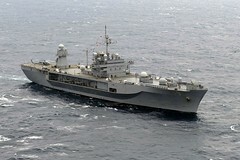 USS Lake Champlain (CG 57) and USS Spruance (DDG 111) will participate in the Portland Rose Festival June 5-9. 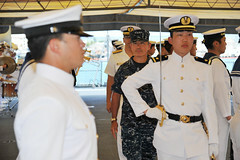 In a speech to a group of newly commissioned Japan Maritime Self-Defense Force (JMSDF) officers June 3, Adm. Harry Harris Jr. stressed the importance of regional relationships in maintaining security in the Indo-Asia-Pacific while also commending them for their collective service. USS John S. McCain (DDG 56) and USS Wayne E. Meyer (DDG 108) are participating in a bilateral exercise with ships from the Republic of Korea Navy June 2-6. In an effort to boost medical readiness in the city of Kupang, Indonesia, service members from Pacific Partnership conducted a weeklong training program for local midwives to assist in the delivery of newborn babies. 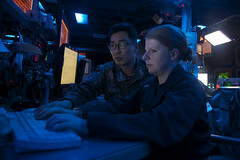 The U.S. 7th Fleet flagship put the Code for Unplanned Encounters at Sea (CUES) to practice June 2 with the Japan Maritime Self-Defense Force ship as it transited to Vietnam for Pacific Partnership.